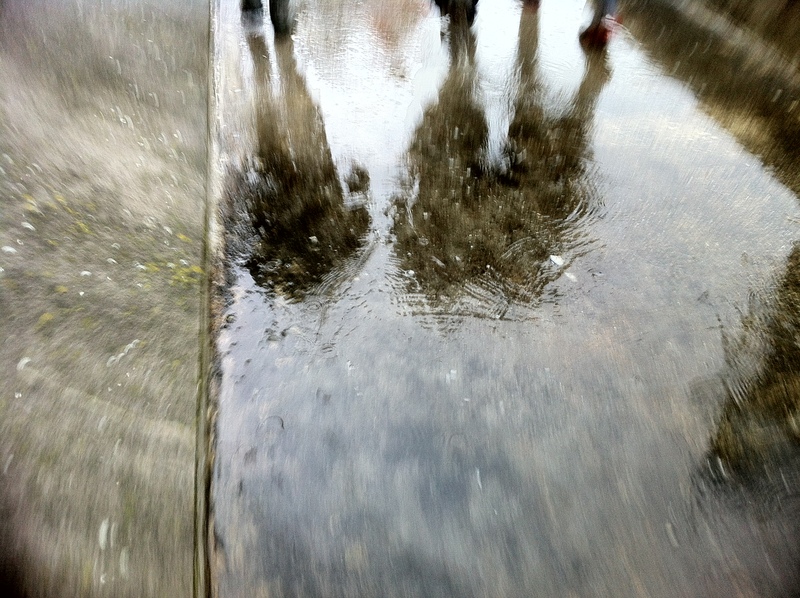 Certain weather conditions create different atmospheric ‘hues’. 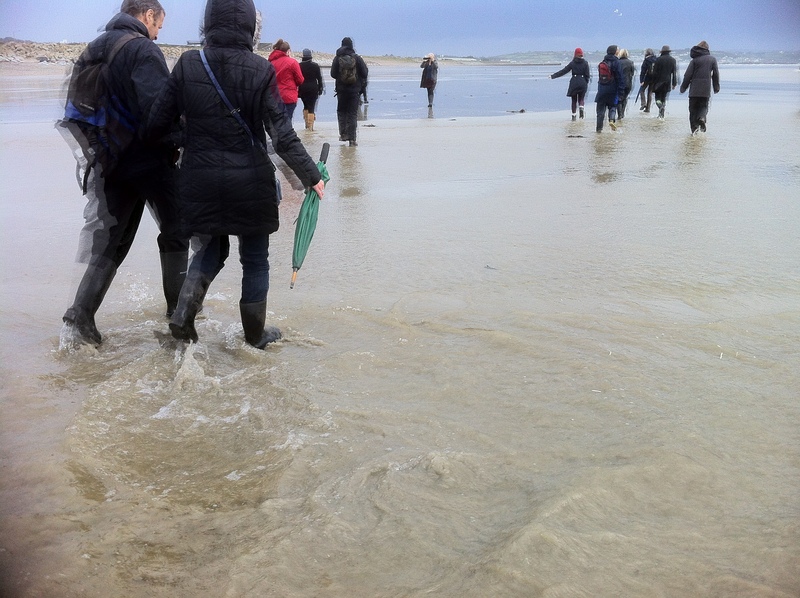 Sunday’s stormy weather was no exception. For me, the drama began the previous night when I was woken, not by the thunder and lightning, but by the sound of a very frightened whippet frantically digging up the rug in search of a hiding place. I consequently spent much of the night trying to sooth her frazzled nerves. As the new day dawned I just wanted to pull the covers up and ease myself into it by reading the papers in bed with a bowl of porridge and a double espresso. However, this was no ordinary Sunday morning. 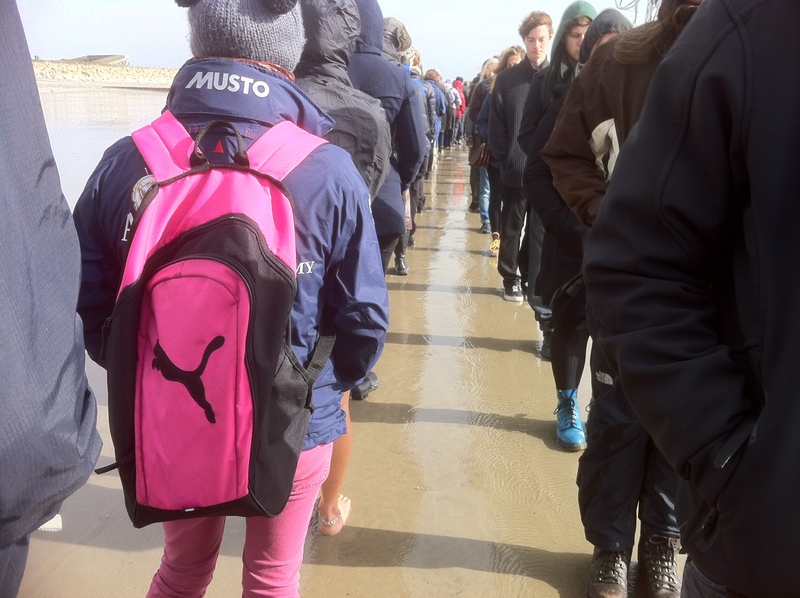 After all, how often do you get the opportunity to be part of a ‘Hamish Fulton communal walk’? 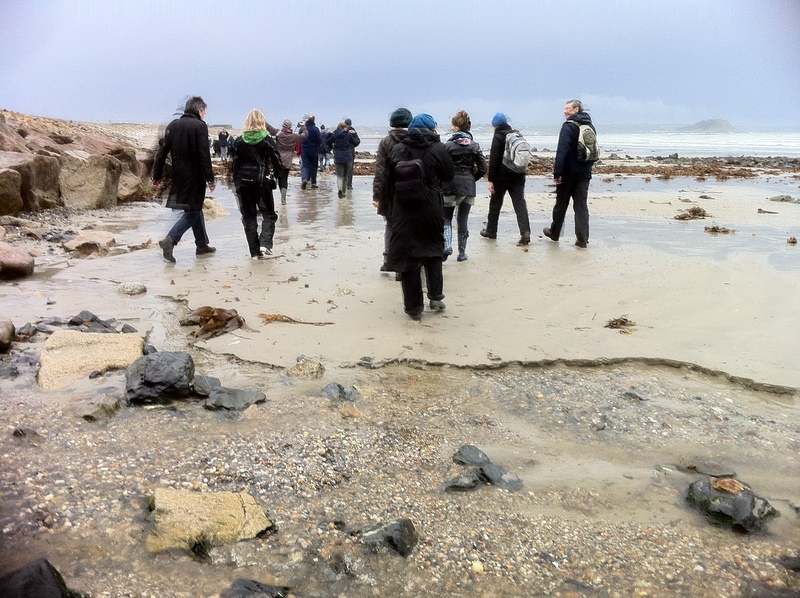 Sunday’s walk was to be the second walk organized by the ‘walking artist’, as part of The Cornwall Workshop. 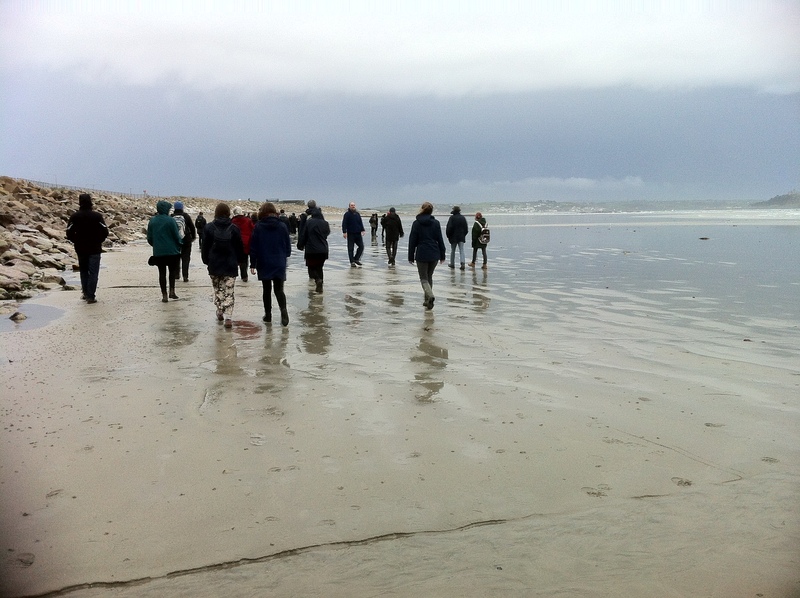 There is an excellent account of the first walk on Saturday, here, posted by Ellen Mara De Wachter, one of the Cornwall Workshop participants whom I met over a welcome mug of home-made soup at the Exchange afterwards. 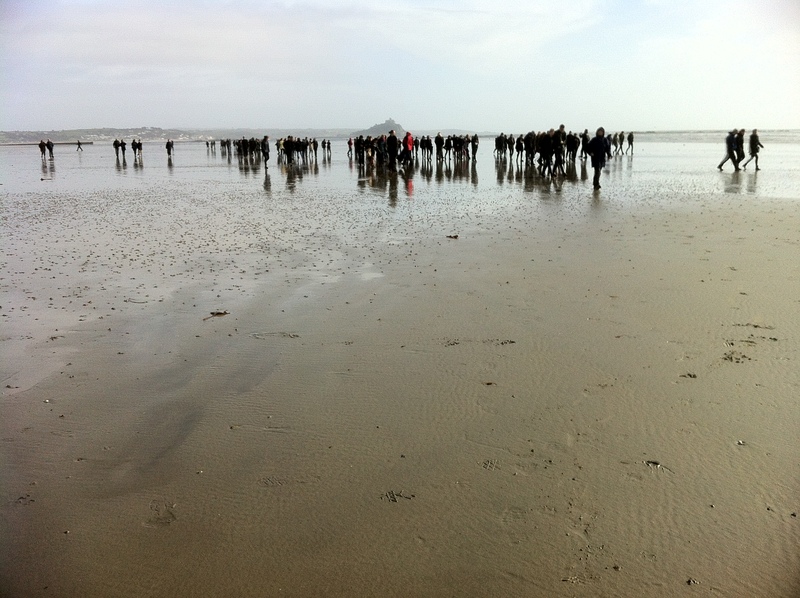 This communal walk was to be an orchestrated walk on the beach at Mounts Bay. Nearly 200 people answered the call-up for volunteers, some travelling from as far away as London and who knows where else? 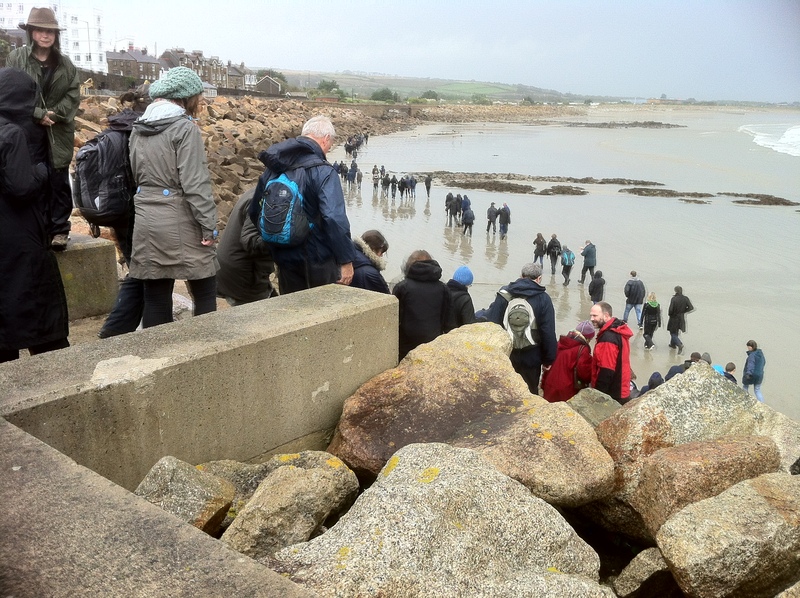 Low level rumbles of thunder could be heard in the distance as we gathered at Penzance station. Most of us were muffled up against the storm clouds that not only threatened but also delivered their load of showers at intervals. We had been told that once we started the walk we must not leave the line and that a lightning strike (a very real possibility) was the only thing that would cause it to be abandoned. The ‘collective’ snaked their way from the station along the sea wall beside the railway line, down the steps spilling out onto the beach. 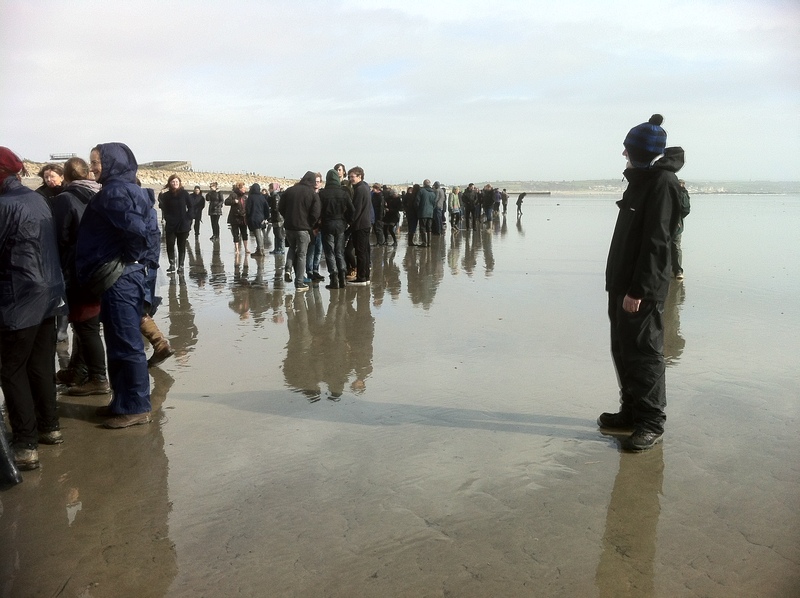 The walk had been timed to coincide with the lowest point of the spring tide, and having forded the river that runs onto the beach we once more gathered on the flat expanse of sand to await instructions. 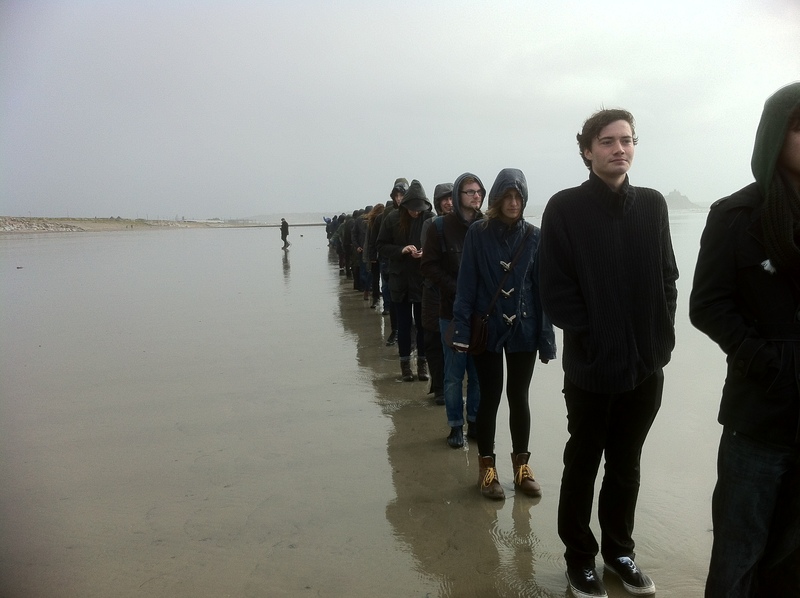 The plan: Two lines of 100 people in each, an arm’s distance apart, walking at a VERY SLOW shuffle in opposite directions like two trains passing each other on the tracks until the first in line comes level with the last in line on the opposite side. In complete silence. The whole event timed to take exactly one hour, with monitors placed in the middle of the line, scheduled to pass each other at the half way point – which they did, apparently. 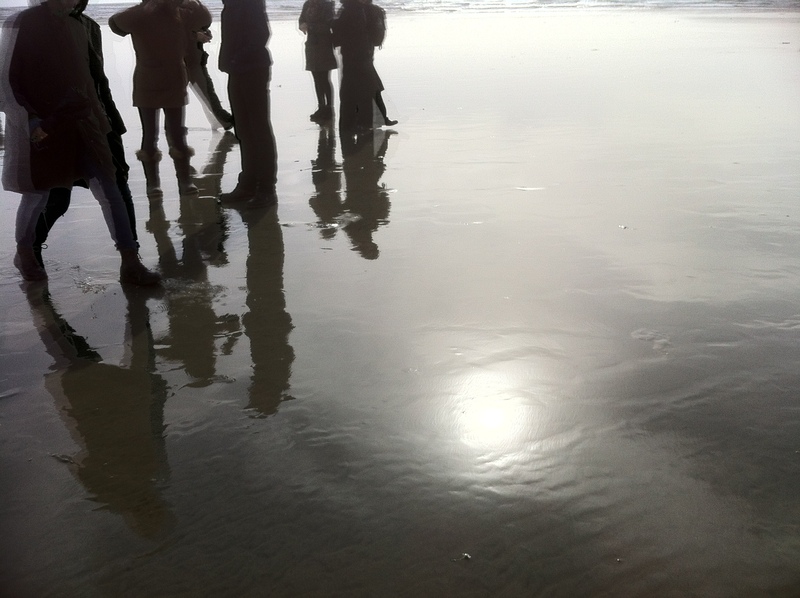 At noon, on the dot, Hamish Fulton, at the front of ‘my’ line began the slow shoe-shuffle action and Jesse Leroy Smith began the procession of the opposite line, inch by slow inch along the sand. As queues go, these two were extremely well behaved. I wondered if this might be possible anywhere else in the world? I even felt guilty turning around to take a look down the line but did manage to take a few photos. I turned my face towards the welcome rays of sunshine to counteract the icy blast coming from the west realizing too late I was facing the wrong way and should have been in the other line-up! 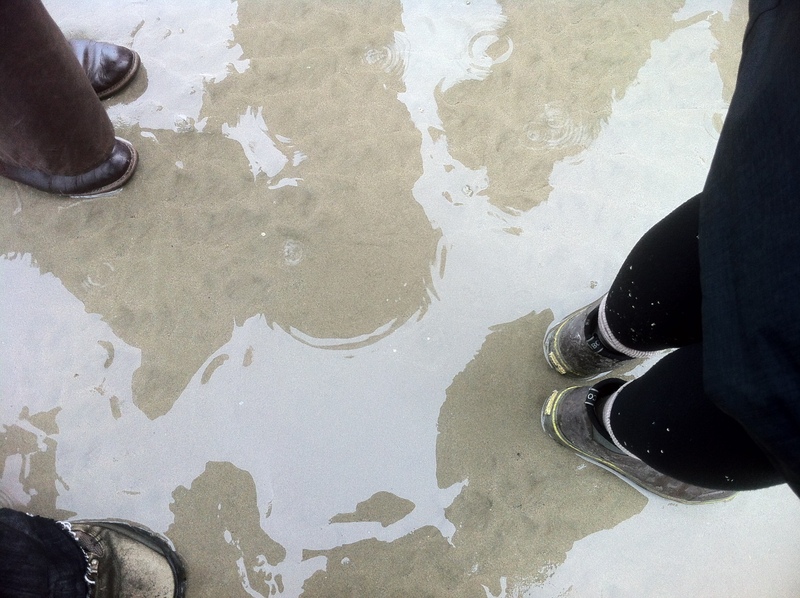 But as a normally solo walker, this experience felt very inclusive, and I was aware that I was participating in something unique. It was surprisingly peaceful. The rain had stopped and except for a few inquisitive dogs and their walkers and the professional photographers with their cameras and tripods circling around us like predatory animals, we had this whole stretch of beach to ourselves. A truly sentient experience: feeling the direction and strength of the wind on my face; measuring the distance my foot travelled at every step; the gentle sway of my body as it slowly moved forward at an imperceptibly slow pace; noticing where I directed my gaze, recognizing a few faces in the crowd of strangers; enjoying the wide assortment of foot-ware (and marveling at a couple of pairs of bare feet); a yellow coat providing a welcome accent of colour against the dark jackets; shadow shapes on wet sand looking like glazed pottery; hearing the roar of the wind and sea when I closed my eyes; feeling my body getting colder and my legs getting heavier whilst at the same time gradually becoming more tuned into the moment. 200 people moving as one, converging to become a double exposure as seen from the inside. The light on the beach at that moment could not have been more beautiful or the setting more spectacular with the backdrop of St Michael’s Mount. 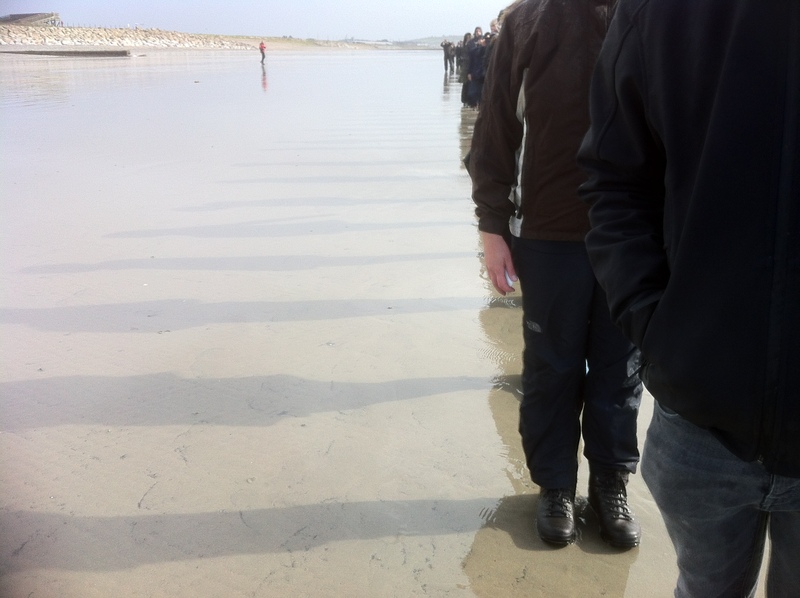 As an observer, from the shore line and viewed against the light, the dark vertical lines must have appeared like a human bar code. The angle from that viewpoint would be the more familiar one in Hamish Fulton’s imagery. As a participant in this artwork, this was the hue of me: an anonymous black line in a slow-moving, human bar code. On the dot of one o’clock and at the climax of the synchronized lines, the crocodile just fell apart and we all dispersed as if we were on a film set and someone had shouted ‘cut’ though not a word had been spoken. Groups of people began to drift off to resume their normal Sunday afternoon activities. I am aware my pictures tell their own story. I wonder what Hamish Fulton will make of it all? The first and the last pictures are just amazing! Great job! Thank you Thatiana! 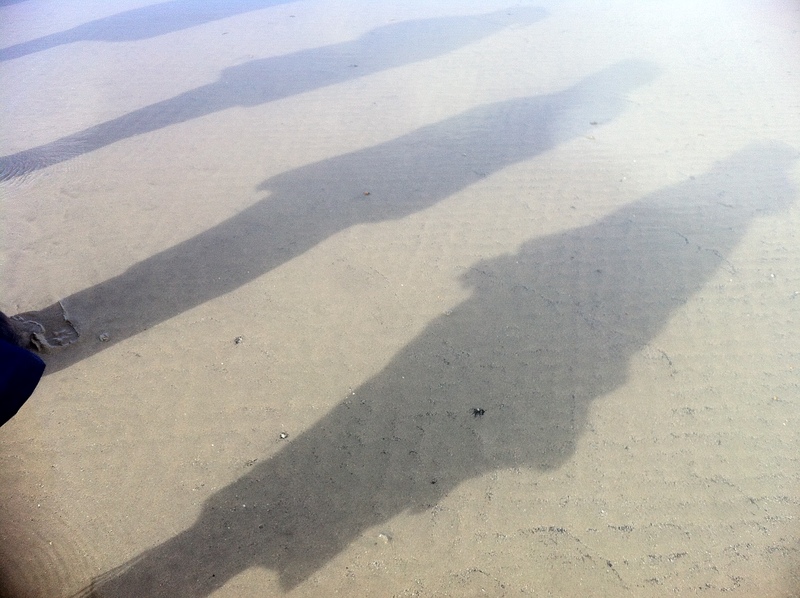 I like those too and also the one in the middle which is just shadows of people milling around on a wet beach. All the photos were wonderful, it was difficult to choose just a few! I can imagine how hard it was! For me they are all great! But when it comes to minimalism, it always gets my heart. Amazing job! Thank you Tiare! That’s why I decided to use it as my blog image (for the time being). There is a kind of timeless quality about shadows and I love the graphic shapes and sometimes distorted imagery they give us.